The people who expected on Friday the Hague tribunal for former Yugoslavia to release the most high-ranking military officers so far - generals Ante Gotovina and Mladen Markac - were not many. 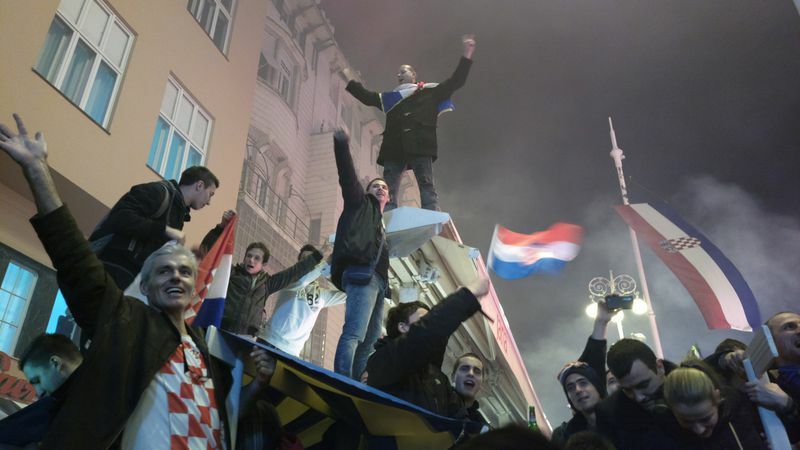 Instead of confirming their sentences of respectively 24 and 18 years in prison, the Appeals Chamber found them innocent and released them, which caused genuine nation-wide celebrations in Croatia and a lot of insult and sadness in neighbouring Serbia. And all this, days before the 21st anniversary from a landmark for the Croats event - the massacre in Vukovar. Gen. Gotovina is the commander of operation "Storm" in the southern part of the self-proclaimed republic of Serb Krajina (Croatian territory, populated before the war mainly by Serbs), and Gen. Markac is commander of the Special Police to the Ministry of the Interior of the young independent Croatia. Because of their participation in the "Storm" operation the two were indicted by the Hague tribunal for former Yugoslavia of war crimes and ethnic cleansing. The Trial Chamber sentenced them on the 15th of April 2011 to 24 years in prison for Gen. Gotovina and 18 years for Gen. Markac - both considered in Croatia national heroes, who led to a successful end the liberation war against Serbia (then Yugoslavia). According to the decision of the Trial Chamber, the two (at the time they were three defendants - Ivan Cermak was found innocent) participated in a joint criminal enterprise, whose purpose was to drive the Serbian population out of Krajina. The court quotes the available evidence and the testimonies of witnesses. One of the key points in the indictment is a meeting that took place on the 31st of July 1995 on the Croatian island Brijuni during which the then first Croatian President Franjo Tudjman gathered together the military brass to discuss with them the forthcoming military operation. During that meeting, the court says, the participants discussed how important it was the Serbs from Krajina to be forced to leave as a result of an assault. Responding to a statement in that sense of President Tudjman, Ante Gotovina is quoted saying: "A large number of civilians are already evacuating from Knin and heading towards Banja Luka and Belgrade. That means that if we continue this pressure, probably for some time to come, there won’t be so many civilians - just those who have to stay, who have no possibility of leaving". 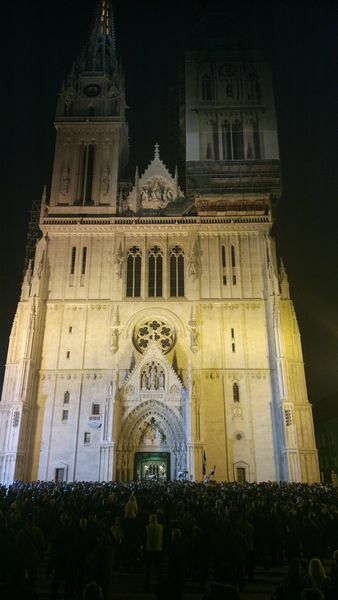 According to the Trial Chamber, Tudjman, in his capacity as a major political and military leader in Croatia before, during and after the period of indictment, was a key member of the joint criminal enterprise. Nonetheless, the court comes to the conclusion that Ante Gotovina did take part in the meeting in Brijuni and contributed to the planning and preparation of operation "Storm". Moreover, the decision reads, Gotovina did not undertake any serious measures to prevent and to follow up the crimes reported to have been perpetrated by his subordinates against Serbs in Krajina. 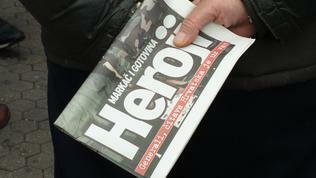 This failure of Gotovina had an impact on the general attitudes toward crime in the Split Military District which was under his command, the court believed. In the same vein is the indictment of Gen. Markac. The defence of the two generals appealed the sentence, which was reviewed by a special five-member Appeals Chamber, presided by Judge Theodor Meron, who is also president of the Hague tribunal for former Yugoslavia. On November 16th, the Chamber came up with a decision on the generals' appeals. 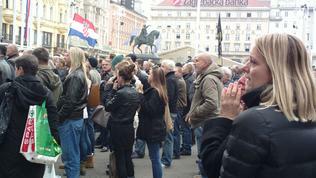 Precisely in 9 o'clock in the morning, in the central square in Zagreb, as in 2011, a huge screen was installed and several hundred people gathered to watch live the reading of the verdict. Before the beginning of the session in Hague, those who expected, or more or less hoped, the generals to be found innocent were just a few which is why the mood in the square was rather minor. Among the people, could be seen a lot of war veterans, relatives of war veterans and ordinary citizens. 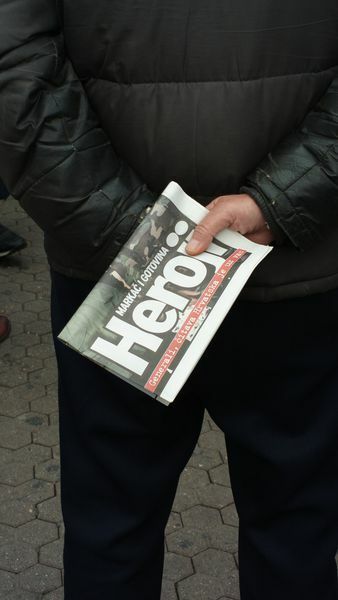 All big media outlets in the country were broadcasting live from the Hague and the topic was on the first pages of the newspapers. The reading started. The decision of the appellate judges is based on two fundamental points in the conclusions of the Trial Chamber - the lawfulness of the artillery attacks on four towns - Knin, Benkovac, Obrovac and Gracac - and the generals' participation in a joint criminal enterprise. On the two accusations, the Appeals Chamber rejected the previous decision with the motive: the first instance chamber accepted the artillery attacks on the four towns as unlawful on the basis of an impact analysis on individual sites. This analysis is based upon a 200 meters range of error standard. The appellate judges unilaterally conclude that this standard was wrongly defined because it is unclear on what foundations it was built. The court quoted expert witnesses who testified about factors like wind speed and air temperature that have impact on the precision of attacks of the Croatian army against the four towns. In the motives, however, it is explicitly pointed out that there were insufficient evidence to analyse those factors in each of the four towns. 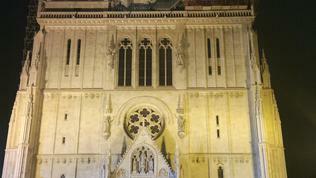 Nevertheless, the Trial Chamber used the 200-meter standard. Although additional evidence were considered in support to the claim that the attacks against those towns were illegal, the appellate judges, excluding Judges Agius and Pocar, state that the evidence is insufficient. On the basis of this ruling, the other points of the indictment are rejected because they, too, are based on the claim that the attacks on the four towns were unlawful. The appellate judges, with Judges Agius and Pocar dissenting on most of them, reject the 2011 sentences and pronounce Generals Gotovina and Markac innocent, ordering their immediate release. A decision that caused an explosion of popular joy in Croatia. Judge Carmel Agius is from Malta and Judge Fausto Pocar from Italy. Both disagreed with the decision. 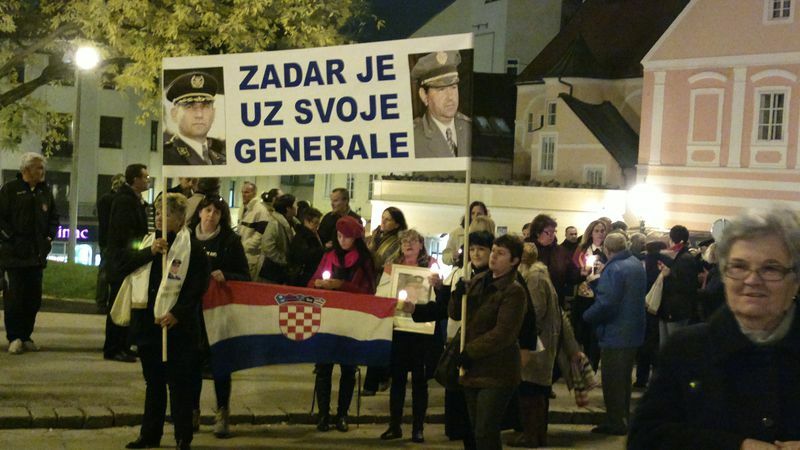 The news possessed the entire public domain in Croatia, charged from the night before when there were vigils and prayers in support of the generals all over the country. 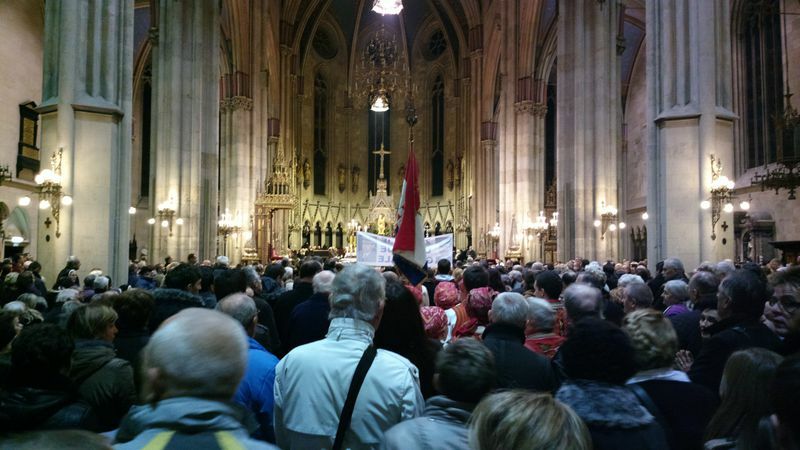 For the Croats this decision is a triumph of justice, while for the Serbs it is an insult. The government in Zagreb immediately sent the governmental plane to take the generals home from the Hague and the mayor of Zagreb organised, again on the central square Ban Jelacic, a huge celebration. After the announcement of the court decision, Prime Minister Zoran Milanovic made a special statement for the media, which he started with the words "A stone fell from my heart". In his words, there was a lot of politics in the decision, proved by the fact that two judges were against and three were for, "which only speaks of how thin the line between success and failure is, between truth and untruth". Milanovic explained that there were a lot of mistakes during the war, but for them the country is responsible not Markac or Gotovina. 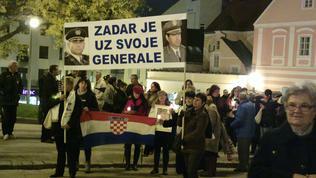 He vowed that Croatia will settle its dues to justice. Vesna Pusic, first deputy prime minister and minster of foreign affairs, said that "the sentence does not in any way mean an amnesty for convicted in war crimes, neither does it mean avoiding prosecution of defendants or suspects in war crimes". The announcement came at a time when the Croatian parliament (Sabor) was due to discuss the changes in Zoran Milanovic's cabinet after the resignation of his first deputy Radimir Cacic. The news, however, took over the agenda and was a reason for vocal exchanges between Milorad Pupovac, vice president of the Independent Serb Democratic Party, and other members of Parliament. Pupovac welcomed the acquittal of Gotovina and Markac, but asked "who then will answer for the crimes that were done?" Several MPs explained that it was about a liberation war, in which the generals had an active role. In Serbia, the reactions were and still are of insult, but it is possible the decision to have much more severe consequences for the region. In an official statement of the Serbian government it is said that it had taken down from the agenda all points that were related to the transfer of documents to the Hague tribunal, "which does not mean cooperation with the tribunal is suspended, but that it is reduced to a technical level". It is also reported that the government of Serbia expressed grief from the verdict because it causes pain for the victims and their relatives. 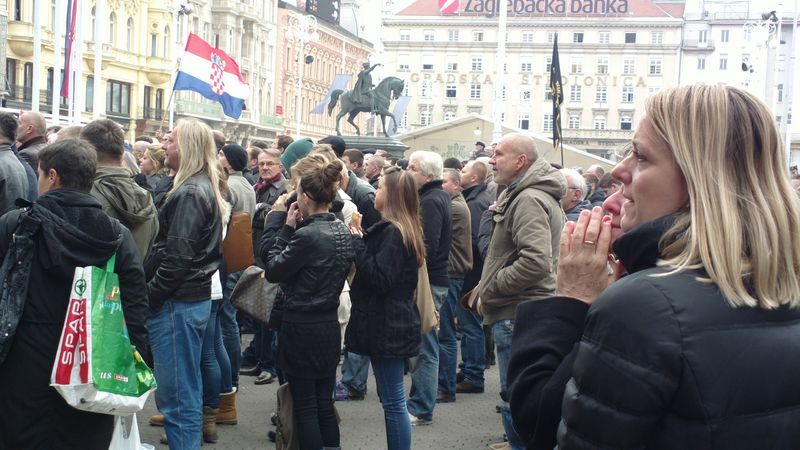 Boris Tadic, former president and leader of the Democratic Party, warned, however, that the biggest danger now is the verdict to lead "to certain triumphalism" in Croatia. In his words, the sentence would have strong social consequences for the Serb-Croatian relations. One of the symbols of the tribunal for former Yugoslavia, former prosecutor Karla del Ponte, who had prepared the indictment of the generals, said she was shocked from the acquittal. "I'm completely shocked! The evidence were obvious! I don't want to explain, but I see that two judges out of five did not support their release and I read their opinion with great interest", she said. Nonetheless, the Croats welcomed the generals as genuine national heroes. 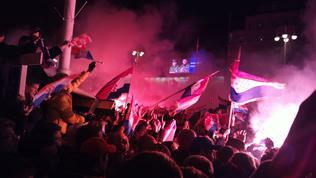 With the very landing of the plane at the Zagreb airport, the air controllers congratulated the generals, and the Ban Jelacic square in Zagreb proved small for the tens of thousands of citizens - from toddlers to oldest people - who sang like one Croatian patriotic songs, shouted "Vukovar", "Ante", "Mladen". 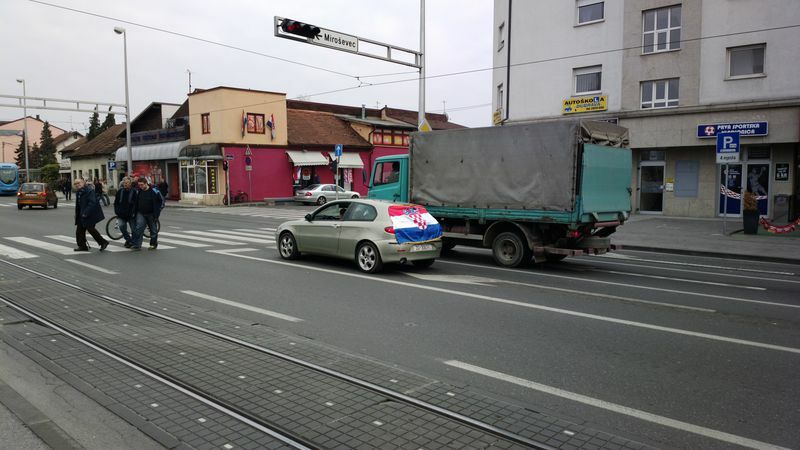 Everywhere in the city, the national flag could be seen hung from windows, cars, young people waving flags on public transport stations. And at private parties you could hear Croats dedicate their first toast "to the generals". After more than an hour of waiting at the square on Friday evening, Ante Gotovina and Mladen Markac appeared briefly to greet the public. Before the cheering crowd Gotovina said: "This is our victory. There was a storm in the war, this now was a legal storm. We have won! The war belongs to the past. Let's turn together to the future!" 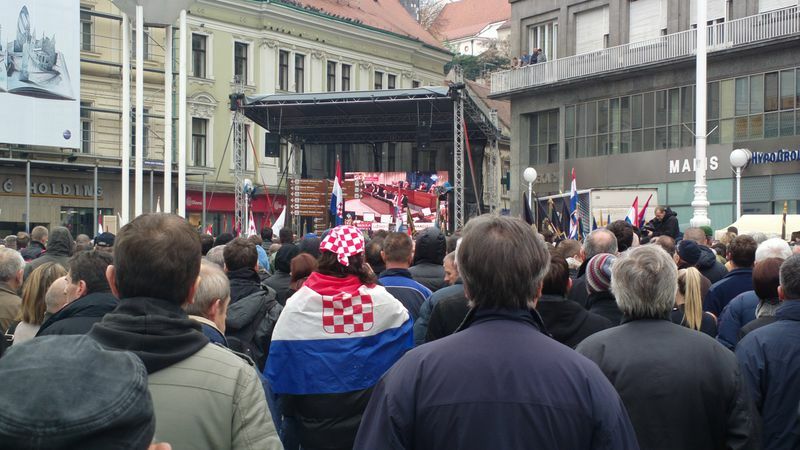 He thanked the Croatian institutions for the support throughout the 7 years of detention, which was booed by thousands of Croats. Mladen Markac, for his part, said that now Croatia is truly free. "I'm happy that in the future every Croat and their descendants, anywhere in the world, can now say they have a motherland which we have liberated without any dirty things". The generals Ante Gotovina and Mladen Markac contributed a lot to the future of Croatia - for its freedom and for its starting accession negotiations. Now the question is how Gotovina's call the war to remain in the past would resonate in a region where the wounds from one of the bloodiest wars in Europe after World War II are still fresh. And this is not a question the answer to which is sought only in the region, but in Brussels and the Hague as well. Not enough news outlets are reporting that this region of Croatia was primarily populated with citizens of Serbian decent. These were just everyday people who lived, worked and paid taxes in Croatia. What the Croatian army did was blatent ethnic cleansing. Of course though, the media will somehow find a way to turn this story around as well. I'm sure that one day I'll be reading about how Serbs attacked Serbs in Croatia and forced them to leave all of their lively possessions behind. The press are not reporting that the Serbs were evacuated prior to the commencement of Operation Storm on orders from their own authorities. How else could they have packed their cars, tractors and trucks with all their personal possessions as seen in many photos if they were fired upon by surprise? Fact is, there were many empty homes for them to transfer into in Bosnia, courtesy of ethnic cleansing undertaken by Serbs up to 1995. Croats are nazis, America and Germany were involved in the brakeup of Yugoslavia, Hague tribunal is a farse.